Via Downes, today, a link to a Chronicle of Higher Ed story asking: “When Professors Print Their Own Diplomas, Who Needs Universities?, and which reports on the distribution of ‘personally guaranteed’ certificates by open educator David Wiley to participants who were not formally enrolled in, but were allowed to participate in, (and were ‘unofficially’ graded on) an open course that ran last year. Hopefully I’ll get a chance to ask David about that tomorrow. because I think this sort of ‘personal vouchsafe from a credible source’ could be a powerful ingredient in an “Open Achievements API”. But plenty of folks outside of higher education might jump in. Imagine the hosts of the TV show Myth Busters offering a course on the scientific method delivered via the Discovery Channel’s Web site. Or Malcolm Gladwell, author of the best-selling Tipping Point, teaching an online business course on The New Yorker’s site. Or a retired Nobel Prize winner teaching via a makeshift virtual classroom set up on her personal blog. 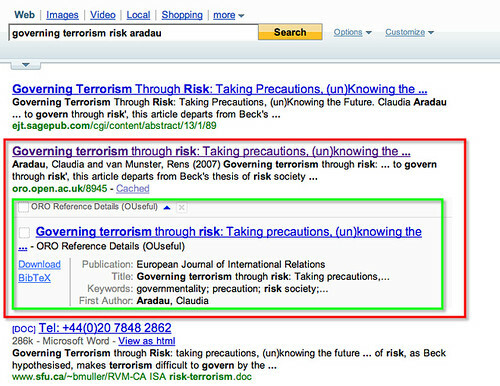 By developing credibility or ‘authority metrics’ (“AuthorityRank”?!) that reflect the extent to which there are legitimate grounds for an agent to ‘bestow an award’ on an individual on the grounds that the individual has demonstrated some competency or understanding in a particular area, we might be able to build a trust based framework for ‘qualifying’ an individual’s capabilities in a particular area with a given degree of confidence. An Open Achievements API would provide a structure for declaring such achievements, and different ‘qualification platforms’ could compete on the efficacy of their authority ranking mechanisms in terms of positioning themselves as ‘high worth’ qualifying engines (cf. 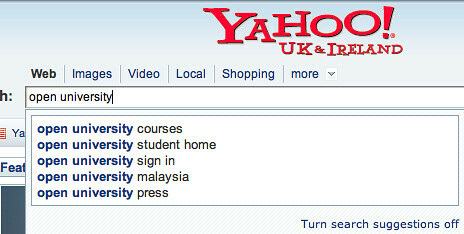 “good universities”). Time to Build Trust With an “Open Achievements API”? I had a couple of long dog walks today, trying to clear a head full of cold, and as I was wandering I started pondering a qualifications equivalent of something like the Google Health Data API; that is, a “Qualifications Data API” that could be used to share information about the qualifications you have achieved. A little dig around turned up the Schools Interoperability Framework, a bloated affair that tries to capture all manner of schools related personal data, although that’s not to say that a subset of the SIF wouldn’t be appropriate for capturing and sharing qualifications. And all the security gubbins covered in the spec might provide a useful guide as to what could be expected trying to actually build the API for real (the Google Health Data API also covers security and privacy issues). must be present and valid. StudentID The Student’s identity number / code. StudentFirstName The Student’s First Name. Required. StudentLastName The Student’s Last Name. Required. StudentDOB The Student’s Date of Birth. Optional. on the Parchment / Certificate. Optional. IssueDate Date the Qualification was Issued. Required. Looking at the above format, it struck me that a far more general “Open Achievements API” might actually be something quite useful. As well as describing formal awards, it could also optionally refer to informal achievements, or “trust measures” such as eBay seller rating, Amazon reviewer rank, World of Warcraft level or Grockit experience points. In a sense, an Open Achievements API could complement the Google Open Social API with a range of claims a person might choose to make about themself that could be verified to a greater or lesser degree. The Open Acheivements API would therefore have to associate with each claimed achievement a “provenance”, that could range from “personal claim” through to some sort of identifier for securing an “official”, SSL transported verification from the body that presumably awarded the claimed acheievement (such as a particular formal qualification, for example). By complementing Open Social, the Open Achievements API would provide a transport mechanism for associating CV information within a particular profile, as well as personal and social information. If it was supported by informal learning environments, such as the School of Everything, OpenLearn, or SocialLearn, it would allow informal learners to badge themselves with a portable record of their learning achievements (much as OU students can do with the Course Profiles Facebook Application). 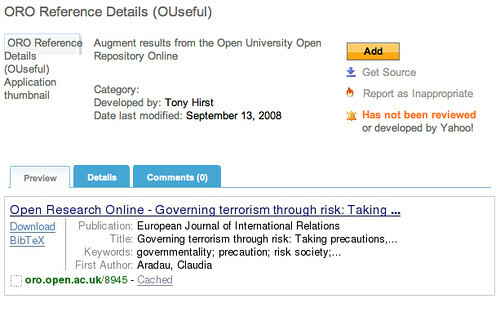 Author Tony HirstPosted on September 20, 2008 September 21, 2008 Categories SocialLearn15 Comments on Time to Build Trust With an “Open Achievements API”? “Vision of a PLE” – a couple of people picked up on the “my PLE” image I used that included offline media and social context alongside the typical web app offerings; you can find the original here: Mohamed Amine Chatti: “My PLE/PKM”. 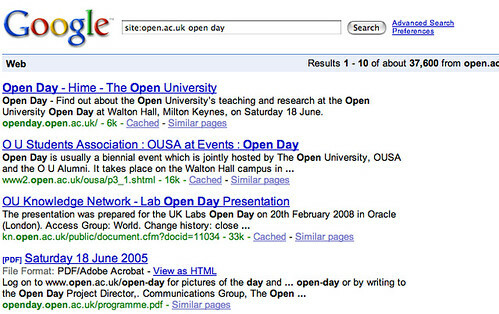 The OpenU’s OpenLearn open content site can be found at http://openlearn.open.ac.uk. 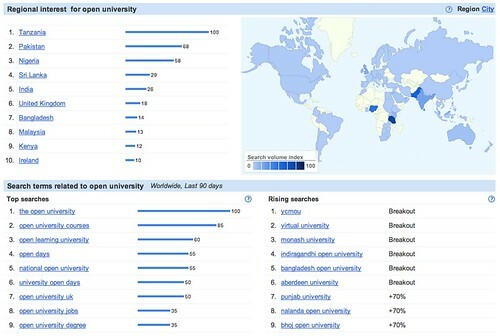 Unlike many other open content sites, the content is published in the context of a Moodle online learning environment that users can join for free. As well as providing a user environment, OpenLearn also makes the content available in a variety of convenient packaging formats (print, Moodle export format, IMS packages, RSS, HTML pages) that allow the content to be taken away and reused elsewhere. Openlearnigg is a corank (Digg clone) site that pulls OpenLearn course unit URLs in via OpenLearn course listing RSS feeds, and then embeds the OpenLearn content within auto-generated course pages using a Grazr widget fed by OpenLearn unit full content feeds. 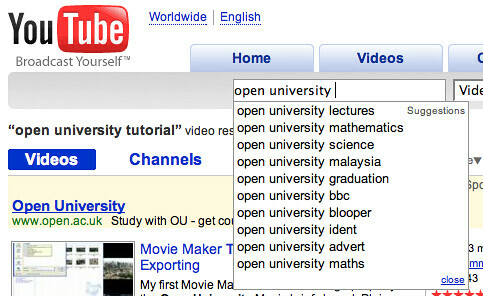 OpenLearningg this uses OpenLearn syndication tools to mirror the content offerings of the OpenLearn site within a third party environment. Something I didn’t mention was a pattern we’re developing for republishing with a click the OpenLearn content in WordPress environment (WP_LE). One of the widgets we have developed allows users to subscribe to “fixed” (i.e. unchanging) blog feeds and receive one item per day from the day they subscribe (which provides some all-important pacing for the user). 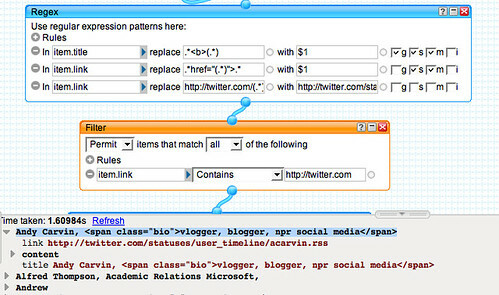 THe “MIT Courseware refactoring as syndication feeds is described in An MIT OpenCourseWare Course via an OPML Feed and Disaggregating an MIT OpenCourseware Course into Separate RSS Feeds, where I show how the feeds can be used in a Grazr widget to provide a presentation environment for an MIT OER course. I seem to remember the feeds were all handcrafted… You can also find links to the demos from those posts. The Yale opencourseware feedification story is briefly covered in Yale OpenCourseware Feeds, along with links to each level of the nested Yahoo pipes that do the scraping. 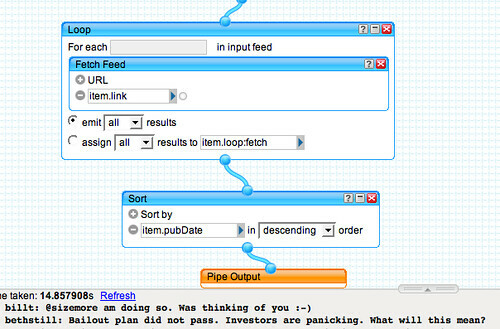 RSS Feed Demo from Yale Open Courseware gives a quick review of one how one of the pipes works. The UC Berkeley Youtube video feeds/video courseware search are described in UCBerkeley Youtube Playlist Course Browser & Video Lecture Search and UC Berkeley Lectures on Youtube, via Grazr (the search part). One of the aims of the MIT/Yale OPML feed doodles was roundtripping – taking an OER course site, generating feeds from it, and then recreating the site, but powered by the feeds. Getting a feel for the different sorts of feed could be bundled together to give a ‘course experience’ by reverse engineering courses is a stepping stone towards automatically generating some of those feeds using contextual searches, for example. The Digital Worlds uncourse blog experment explores using a hosted WordPress blog as a course authoring environment, and the approriate use of tag and content feeds as delivery channels (the Visual gadgets uncourse blog does a similar thing using Blogger/Blogspot). Some of my reflections on the Digital Worlds creation process are in part captured in the weekly round-up posts that can be found here: OUseful 1.0 blog archive: Teaching and Learning posts. There’s also a presentation on the topic I gave to the OU CAL research group conference earlier this year: Digital Worlds presentation. (the URL structure is described here: StrinGLE URL “API”). Martin Weller also had a go at describing it: Stringle – almost a web 2.0 PLE?. ANd the final link – was that was to http://ouseful.info, which currently resolves here, at the OUseful.info blog: https://ouseful.wordpress.com. PS The whole “figure:ground” thing comes from psychology/studies on visual perception, though it turns out that Marshall Mcluhan also started using the phrase to capture a distinction between communciation technologies (the “medium”, viewed as the figure) and the context they operate in (the ground). I keep dipping in to odd bits of Mcluhan’s (and some of them are very odd!) and this medium/context is probably worth thinking through in a lot more detail with respect to “PLEs”. It’s been a long – and enjoyable – day today (err, yesterday, I forgot to post this last night! 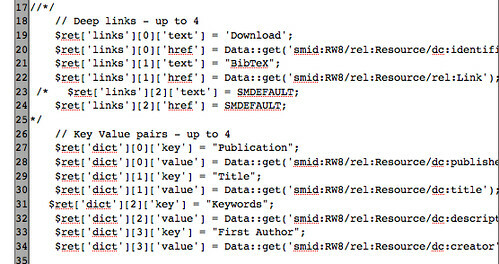 ), so just a quick placeholder post, that I’ll maybe elaborate on with techie details at a later date, to show one way of making some use of the metadata that appears in the ORO/eprints resource splash pages (as described in ORO Goes Naked With New ePrints Server): a Yahoo SearchMonkey ORO augmented search result – ORO Reference Details (OUseful). It’s late – I’m tired – so no more for now; if you interested, check out the Yahoo SearchMonkey documentation, or Build your own SearchMonkey app. A few weeks ago, the OU Open Repository Online (“ORO”) had an upgrade to the new eprints server (breaking the screen scraping Visualising CoAuthors in Open Repository Online Papers demos I’d put together, sigh…). Can I set up RSS feeds from ORO? RSS feeds can be generated using search results. Enter the search terms and click search. RSS icons will be displayed at the top of the search results. Right click the icon and click on Copy Shortcut. You can then paste the string into your RSS reader. It is also possible to set up three types of RSS feed, by OU author, by department and by the latest 20 additions to ORO. Substitute author for the author’s OUCU and paste the new string into your RSS reader. locate your department and note the URL (this will appear in the bottom left corner of the screen when you hover over the link). 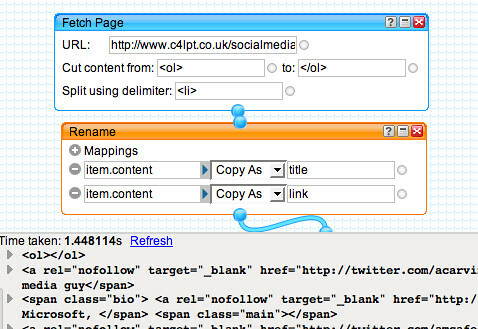 The departmental code is situated between “http://oro.open.ac.uk/view/faculty_dept/&#8221; and “.html”, e.g. “cobe”, “arts-musi”, etc. 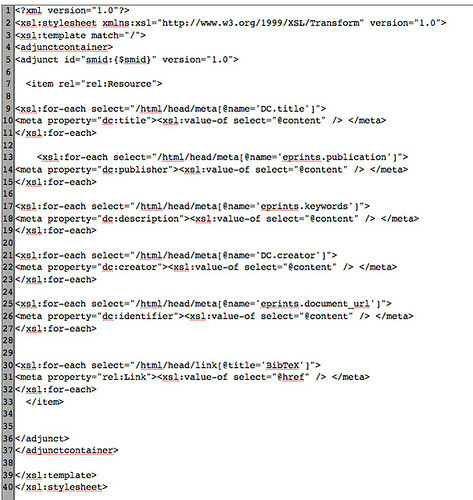 Copy the department code into the relevant part of the string and paste the string into an RSS reader. Output formats include an ASCII, BibTeX, EndNote, Refer, Reference Manager and HTML Citations; a Dublin Core description of the resource; an EP3 XML format; METS and MODS (whatever they are?! ); and an OpenURL ContextObject description. The URLs to each export format are regularly efined and keyed by the numerical resource identifier, (which also keys the URL to the resource’s HTML splash page). The splash page also embodies a resource description meta data in the head (although the HTML display elements in the body of the page don’t appear to be marked up with microformats, formal or ad hoc).